On October 4, 2015, I had the pleasure of attending a monthly brunch hosted by Millahcayotl in preparation for our first annual People’s Harvest Forum, to be held December 2015 in San Francisco, California. Our October brunch topic was GMOs— genetically modified organisms, specifically those implicated in food production. We assessed myriad problems with the use of GMOs, including ecological and social. Here, I will endeavor to break down a few of these before delving into how this issue specifically impacts the vegan community, and how the ways in which the media portrays those against the use of GMOs closely mirror the prevailing arguments against veganism and stereotypes attributed to vegans. GMOs are currently being employed in a global scale, with the five countries growing the most GMOs being the United States, Brazil, Argentina, Canada and India. The primary genetic modifications currently being conducted on crops are a) to develop crops that are resistant to pesticides (particularly Roundup, a pesticide created and distributed by Monsanto which may have cancer-causing properties), and b) to develop crops that are capable of producing their own pesticides, thus eliminating any “need” to manually apply pesticides to them. Ultimately, these smaller goals are halves of the larger goal of increasing crop yield, which pro-GMO lobbyists argue will have the potential to greatly reduce, if not outright eliminate, world hunger by dramatically increasing the amount of food grown using the same amount of land. 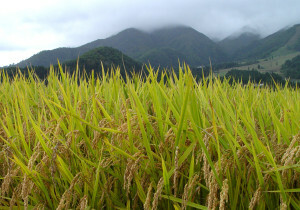 From an ecological standpoint, a prevailing argument against the genetically modifying crops is that due to the uncontrollable and often unpredictable nature of pollination, rather than simply affecting the crops grown by a farmer who chooses to engage in GMO farming, GMOs have the potential to affect multiple crops across great distances. In other words, non-GMO crops can be cross-pollinated by GMO crops. This also not only endangers like crops (i.e., GM corn being cross-pollinated with non-GM corn) but also related crops (GM broccoli being cross-pollinated with non-GM broccoli, non-GM cauliflower, non-GM brussels sprouts, and so forth). Cross-pollination coupled with the use of harsh pesticides results in a loss of biodiversity, leaving regions more susceptible to climate change, pests and other nasty elements that threaten both our individual or even cultural food supplies and the overall health of our planet. Basmati extra long grain rice field in India. There are also many social justice issues inherent in the use of GMOs, one of which overlaps directly with the issue of cross-pollination. For years now, companies such as Monsanto have been patenting specific crops, meaning that they essentially own the legal rights to the production of specific types of foods— in other words, they are putting a copyright on life itself. In 1997, a Texas-based company called RiceTec Inc. was able to obtain a patent for “Basmati Rice Lines and Grains,” threatening the ability of small-time farmers in India and other parts of South Asia to produce a crop they have been growing for years without any help from the US or anyone else. A shocking number of Indian farmers have committed suicide in recent years due in large part to their ever-mounting debt, which relates directly to the constant threat by GMO companies under which they must try to continue making a living. Meanwhile, Monsanto sued Canadian canola farmer Percy Schmeiser in 2004, after unlicensed GM canola (cleverly dubbed “Roundup Ready,” as the canola was grown specifically to resist Monsanto’s own Roundup pesticide) was found on his farm. Percy did not grow these crops himself; they were the result of cross-pollination, a threat from which no farmer can insulate their crops entirely. Ergo, it seems that these patents on life itself can be used not only to prevent farmers from growing what they want but also to sue farmers for accidentally having grown something they never wanted in the first place. Another social justice issue that is commonly masked by GMO propaganda is that even vitamin-enriched GM crops won’t save the world from malnutrition, and high crop yields won’t ultimately save the world from hunger. Golden Rice, rice that has been genetically modified to contain beta keratin, has been heralded by pro-GMO lobbyists as a solution to the ever-growing number of people in South Asia and parts of Africa who suffer from severe Vitamin A deficiency. The idea is that, if you take a population that eats mostly rice, and enhance that rice with vitamins, voila! The population will be saved! The problem with this line of thinking is that rather than correcting the root of the problem— that the diets of people living in these regions lacks diversity— products like Golden Rice will merely put a bandage over the problem. Rather than ask how we can pump more nutrients into rice, what we should be asking is, Why are so many people around the world subsisting on just a bowl or two of rice per day? With respect to hunger, similarly, it is naïve to think that genetically modifying one or two or even three crops will solve the problem. World hunger isn’t an issue because there is a lack of food in the world; it is an issue due to the inefficiency and injustice with which the existing food of the world is distributed. So, what does any of this have to do with veganism? 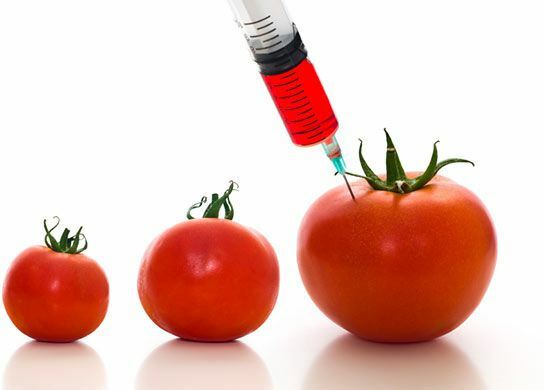 Aside from the myriad human rights abuses inherent in most tomato production, tomatoes are now being made even less vegan via the introduction of fish genes. For starters, genetically modified crops are often modified using animals. A tomato has been genetically modified using fish DNA so as to increase the fruit’s frost-tolerance. Aside from the myriad labor issues surrounding certain “vegan” foods, which cause myself and other vegans to label animal product-free items nevertheless non-vegan, fruits and vegetables now have the potential to become more obviously non-vegan through fusion with animal DNA. The majority of GMOs are also used not to feed humans, as pro-GMO lobbyists would have you believe, but to fuel cars, create non-edible products such as glue, and above all, to feed farmed animals. 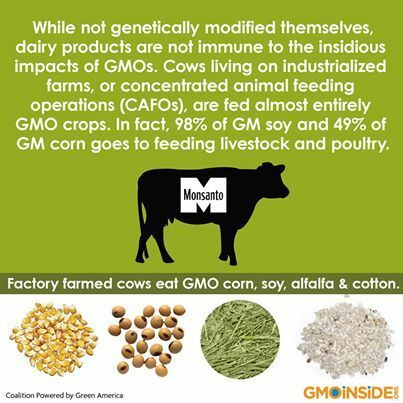 The GMOs most commonly used to feed farmed animals in the US are GM soybeans. One common argument against veganism is that overconsumption of soy is irresponsible due to the impact of soy production on the Amazon rainforests, and the existence of GM soybeans has been added to this concern as yet another reason people shouldn’t go vegan. It’s bad for the environment because Rainforests, and it’s bad for your health because GMOs. But the forests being destroyed are not being used to feed humans soybeans— at least, not exclusively vegan humans. The truth is that a small amount of GM soy is present in a wide variety of processed foods, vegan and non-vegan alike; while, again, the vast majority if GM soy is being used to feed farmed animals. It is not being inserted into every block of tofu you’ve ever eaten, and going vegan won’t leave anyone more at risk for consuming GMOs than eating animals does. A candy bar or other cheap snack food, which contains corn syrup (GMO corn), is more likely to contaminate you with GMOs than tofu is. If more people went vegan, it would stand to reason that fewer animals would be farmed, meaning fewer would have to be fed, meaning fewer GM soybeans would be grown, meaning the rainforests would have at least a fighting chance. There is a direct correlation between the way in which the media portrays pro- vs. anti-GMO advocates and how it portrays vegans vs. non-vegans. The media commonly frames anti-GMO activists as being concerned with “food safety,” i.e. their own health and whether or not eating GMOs is safe for them. On the surface, this appears quite selfish, as concern for one’s own health shouldn’t be a strong enough reason to reject a scientific advancement with the potential to feed hundreds of thousands of people around the world. Couldn’t those “health nuts” just abstain from GMOs themselves, without trying to halt the entire process in its tracks? Pro-GMO advocates, by contrast, are portrayed as altruistic types who just want to feed the world. Not only is this misleading because, as stated, the driving force behind world hunger is not lack of food so much as lack of proper food distribution, but also because GMOs do not always result in the increased crop yields for which they were designed. Farmers– or privileged activists, depending on whom you ask– destroy a test run of Golden Rice in the Philippines. This, to me, is reminiscent of the portrayal of vegans as being self-interested “health nuts” with too much time and money on their hands, completely out of touch with the needs of the rest of the world. The GMO debate also parallels this dynamic with respect to a direct action taken by farmers in the Philippines: In 2013, Filipino farmers uprooted golden rice crops in protest of GMOs. Some farmers refused to engage in this practice because apparently in the Philippines, it is considered bad luck to uproot any rice crop. Some media outlets took advantage of the refusal of some farmers to participate in order to paint the participants as naïve “city folk”— not really farmers at all, but rather know-it-all, privileged activists meddling where they did not belong. They also took every opportunity to focus not on the main concern of the farmers— that GMOs are one of many signs of the privatization of our food system— but rather on the claim that GMOs might not be safe for consumption, by far the weaker of the two arguments. That the patent-holders agreed to make their licenses available without royalties is besides the point; the point is that no one should have to seek a license to grow rice in the first place. The main safety issue behind GMOs is not the food itself, but rather the pesticides that will be sprayed onto or, in some cases, produced by GM food— such as the (potentially) cancer-causing Roundup. One final parallel between the pro/anti-GMO stereotypes and the vegan/non-vegan stereotypes is that in both cases, the public is generally beseeched to be “reasonable,” to rely on “science/fact” over intuition, and to do things “in moderation” rather than reject anything entirely. There is a massive push by modern society towards this idea of moderation— that everything is okay in small doses. As a result, anyone who is patently anti-anything is depicted as irrational or illogical. Unfortunately, just as participating in Meatless Mondays still enables you to contribute to deaths of countless animals, environmental devastation and your own physical detriment six out of seven days a week, so too does eating “just a little” GMO nevertheless disadvantage farmers all over the world and put crops everywhere— not just the intentionally GM-ed ones— at risk. The anti-GMO position is often falsely portrayed as a Luddite position, an anti-tech position, but in reality, this isn’t about rejecting all of technology or all of science— it’s about rejecting this one particular result, because it does more harm than good. What could be more rational than that? From a consumer standpoint, the easiest thing anyone can do to demonstrate lack of support for GMOs is to shop conscientiously— something to which we vegans are already accustomed. GM crops are disproportionately used in animal feed, so already by being vegan you are significantly reducing your contribution to the problem. Other items to look out for include processed foods, which often contain GM soy, corn, beet sugar and/or canola, or ingredients derived from these items. Joining campaigns for mandatory GMO labeling in the US is also a good idea, though only a small part of the larger whole. While such labeling would allow us as individuals to more easily avoid consuming GMOs, this does little or nothing for the farmers who are going broke due to the imperialism of our food system, or to combat the disappearance of pollinators that is resultant from the use of pesticides. Campaigns against companies that support GMOs, use pesticides, etc. would ultimately be more successful in addressing the broad scope of the problem. 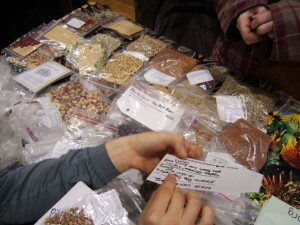 Seeds being exchanged at a seed swap. You can also fight back by promoting seed diversity specifically and dietary diversity more generally. Seed swaps are an easy and fun way to contribute to this, while community gardening and sharing seeds less formally improve accessibility of nutritious food to those who might not otherwise have it— or who might be forced otherwise to pay companies like Monsanto for their food, due to economic hardship. For more information about how to join the struggle against GMOs, check out Millions Against Monsanto, Navdanya and/or The Non-GMO project— or, if you can make it to the Bay Area in December, attend the People’s Harvest Forum! 2. You fail to mention the many environmental benefits of GM crops. Reducing pesticide use by 40%, increasing yields by 20%, and farmer profits by 70% according to the latest meta-analysis. 3. Major GM crops like soy have almost no risk of cross-pollination since they are either self-pollinating (almost 100% for soy) or, when it comes to corn, are only pollinated in a very short time frame (1 week for corn) which also makes it unlikely since the pollination periods have to overlap (and due to heavy pollen they don’t travel far). 5. Percy Schmeiser deliberately stole Monsanto seeds. The first season they found cross pollination he was never sued for that. What he was sued for was for taking only the GM seeds and replanting them – effectively bypassing Monsanto’s patent illegally. Even the most liberal judges agreed that Monsanto’s patents covered those. Now the opposite has become the narrative even though Monsanto has never sued anyone for accidental cross pollination. I would go on but this is a clear ideologically biased article just filled with misinformation. Stick to the ethics of veganism. Science and evidence clearly isn’t your cup of tea. There are many antiGMO tropes echoed throughout this piece. I fear it casts an unfair light upon recombinant DNA technology (GMO). It’s a technology which brings much hope in solving many problems. The story is an exciting one! 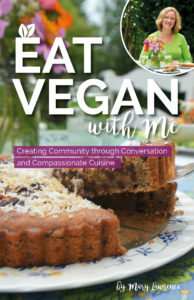 I am happy to have this opportunity to shine some light on the issue particular in regards to veganism. First, it helps first to better understand the context in which this science and technology exists. One might replace “GMO” with “precision breeding” (particularly as to pertains to plants). So if we can customize plants precisely, what kind of traits would we want to explore? After all, most of the food we eat are human inventions through painstaking hybridization. Modifying genomes directly makes sense now that we better understand this process of nature. In a sense GMO is more natural than anything we’ve done previously! This technology is relatively new and like most technologies there are hurdles. Here we have expense and fear. Fear puts the brakes on the technology. It puts pressure to over-regulate something we already understand to be safe. That drives up cost. The result of that is using this technology in areas where a return on investment is most feasible. It’s no wonder then that the state of GMOs today tend to be big commodity crops. Corn and soy indeed are examples and it does make raising of expensive animals cheaper. It’s a testament to how GMO can improve agriculture. It’s up to us to make the ethical case and improve plant foods instead. Giving a whole area of science and technology a black eye isn’t going to give us animal liberation. The fear over GMO creates a self-fulfilling prophecy. With regulatory costs high, only the biggest companies have the resources to overcome the hurdles. That’s where the Monsantos and Bayers etc come in. But we want these tools for the people! Historically these tools were relegated to the hands of only the mighty who could wield them for big ag crops. But we now see these getting into the hands of smaller niche companies and indie developers. That means opportunities for vegans and we see dozens of companies springing up to take advantage of these tools. Genetically modifying yeast to create milk proteins can cut out the exploited middle animals. Plant made to express omega-3 fatty acids instead of farming fish. Egg-free flu vaccines. Etc etc. You bring up many issues and I could address them point by point but I would rather not nitpick and keep this high level. I understand your concerns though. I had them myself once. None of these issues are inherent to GMO though. If there is corporate misdeed, then punish the corporation. If there is a poisonous pesticide, then ban that pesticide. If there is an international injustice, then put pressure on governments. But it is simply not rational to blame, ban or eschew this technology over it. That would put us at a severe disadvantage and we are morally compelled to use every opportunity to feed people and save lives. GMO can do that, is doing that. This indeed is a social justice issue. GMO misinformation is holding back progress in making life better for our animal siblings and cousins. Each genome on this planet is a poetic expression of the language of life. We are all related and it’s that fact that inspires a reverence for life and motivates me as an animal rights social justice activist. Be it for a human living in another part of the world, or the new school dinos we brutalize for their eggs. As such there is no animal gene or plant gene. There are genes and we all descend from a common ancestor. We all have an inherent right for a place on this rock with interests that should be recognized and respected. We no longer should have to rely on exploiting the bodies of other creatures to thrive in spite of cruel nature. This should be particularly true for the inhabitants that experience this world in ways we can most easily empathize. Other animals deserve to benefit from our technological solutions. Solutions that can help us better align our behavior with our ethics. We vegans at VeganGMO champion this science and are a growing contingent. We see the potential and are working on solutions utilizing this technology. The support and understanding from the community is important in this quest. VeganGMO: Why are we pro-GMO? I really hope you publish a retraction of this article soon instead of just ignoring the comments left here. This isn’t “science,” it’s food sovereignty. Justice, not science, there are pseudoscientific references in this article. I’m kinda disappointed particularly when Vegan Publishers recently penned an article complaining about pseudoscience in the animal right movement. Yet here it is on display in all it’s glory! Or is pseudoscience only bad when it’s convenient for predisposed biases? I can demonstrate by addressing your three “hard science” claims. This claim is meant to appeal to species bigotry claiming that genes are unique to species and kingdoms when we are share the genetic language of life. Horizontal gene transfer is a natural process going way before humans could even tie a shoe. b) Golden Rice DOES NOT contain beta keratin. It contains beta-carotene, a precursor of vitamin A. β-keratin protein is found in reptiles and it’s in the in the keratin family. This is the second time this was incorrectly stated. I’ll chalk it up to a typo but it still shows a lack of rigor. c) That is an inaccurate description of cross-pollination. First of all, GMO crops did not invent cross pollination and farmer neighbors have been managing with these issues with handshakes for years. Not all crops even require cross pollination. Onto license and patents. Well did you know GMO didn’t invent seed patents either? Its been going on way before GMO. Golden Rice is a beautiful solution and it takes a hard cynic to oppose it. It is not THE solution, it is A solution and every scientist you talk to will same those same exact words. But we DO have privileged well-fed developed word activists fear mongering about GMO solutions which is taking food out of mouths of the hungry in other countries. Countries who have been developing their own GMO solutions yet people have been scared by our activist into putting up barriers (and bans!) while people starve. And THAT is the social justice issue at play here. It’s a crime against humanity to export your colonialist pseudoscience fear onto other nations keeping their populations starved for solutions, literally. Leaders from Hawaii, Uganda, Bangladesh, Nigeria, Ghana and many more have told me in person that the USA activists have disrupted their food science programs. And you speak of food sovereignty, how dare you? !